"Managing The Needs Of Printer Services and Copiers"
Managing the needs of printer services or copiers remotely, implies managing a high diversity of supplies that are influenced by multiple aspects of monitoring, when the goal is to control and reduce the cost of printing and improving the carbon footprint. 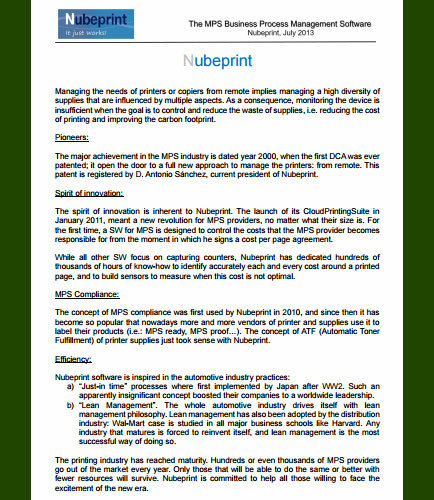 Nubeprint, a pioneer in managing print services( MPS) industry, opened the door to control and reduce the waste supplies and also came up with a new approach to manage printing services through remote devices. Implementing managed print services in business infrastructures adds value by incorporating the business intelligence in managing the cost and boosts the flow of information. Controlling the costs that the MPS provider incurs from the moment a cost per page agreement is signed. Does the data transmitted ensure security? Cloud Printing Suite, is a software for concept MPS compliance, composed by the Cloud Printing Monitor (CPM) that connects through Cloud Printing Server (CPS) that handles the network of agents and transforms the received data into information and services on high security level aspects. This whitepaper imparts insights about implementing a Managed Print Services Program through Cloud Printing Server Security aspects and how CPM provides security in data transmission and types of security in data transmission.